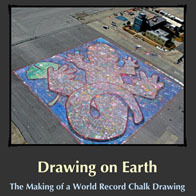 Drawing on Earth is the story of the Kids’ Chalk Art Project. Our first creative community event that set a Guinness World Record for the largest chalk drawing. May 27 – June 7, 2008. 6,000 participants, including over 4,000 elementary school students; two weeks of chalk drawing, 90,000 square feet (300′ x 300′), the story of a salamander and ginkgo leaf, lots of chalk, a satellite photograph, and a special dog. 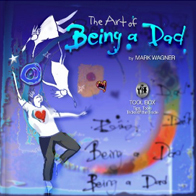 • The Art of Being a Dad is a creative collaboration between a dad and his two small kids, and a glimpse into their relationship for the first seven years. • It’s one man’s journey as he navigates the colliding worlds of babies and career, awe and exhaustion, innocence and responsibility, boundaries and freedom. • It’s also an artist’s visual journal of his relationship with his kids; who they are, what they do, how they do it, and who is he in the face of being a parent, an artist, a man, and their DAD.